Originating in Switzerland, brown Swiss cattle have evolved to live in various terrains and habitats in more than 60 countries around the world. Brown Swiss cattle are most often recognized for their excellent genetics and roles in agriculture, including milk, cheese and meat production. Brown Swiss cattle are thought to be the oldest breed of dairy cattle, originating from Switzerland with bones dating back to 4,000 B.C. Many generations of milking cows evolved into today's brown Swiss cattle. Initially, only 25 bulls and 140 females were imported from Switzerland to the United States. In 2012, the Brown Swiss Associates estimated more than 7 million brown Swiss cattle exist in the world. Brown Swiss cattle have brown or tan fur, white muzzles and floppy ears. 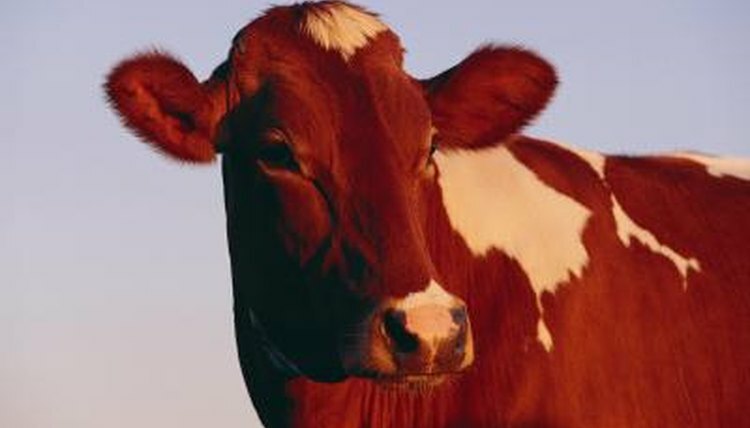 Cows typically weigh up to 1,500 pounds, while bulls weigh upwards of 2,500 pounds. They developed dark blue eyes due to the pigment's ability to block out solar radiation. With a strong build, balanced legs and well-formed feet, brown Swiss cattle are very adaptable to different living conditions and are able to produce milk until they are 15 years of age. Brown Swiss cattle are also well-mannered and peaceful creatures. These cattle also breed very well with other milk and beef cattle. Brown Swiss cattle live in different places around the world, such as the United States, Switzerland, South Africa, Canada and New Zealand. Due to their history from Switzerland, they can endure both hot and cold weather extremes and variable, often hazardous, landscapes, which makes them desirable for agricultural uses. On average, Swiss cows produce more than 220,000 pounds of milk in a lifetime. Brown Swiss cattle generate high yields of milk and cheese, as the fat to protein ratio is ideal for production. In addition to being a top choice for milk production, brown Swiss cattle also have excellent genetics to be used in meat production; having almost 4 percent more weight per cow than competing breeds. However, brown Swiss are raised generally for milk production, while a genetically similar breed, Braunvieh, are raised mostly for meat production.